J.R.R. Tolkien’s masterwork was turned into a film trilogy that is now the standard in the high fantasy genre cinema, and it spawned plenty of crossovers and adaptations. 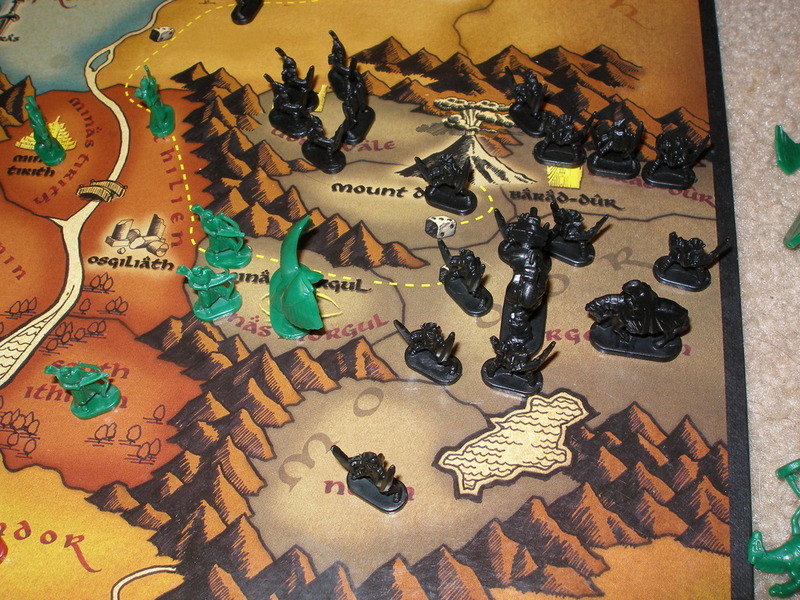 The classic strategy board game RISK was no less different, and that is how RISK: The Lord of the Rings Trilogy Edition came to be. At last, fans of either franchises can now partake in the epic battles between good and evil depicted in the books and the films. Whether you read the books or watched the movies, you should be able to envision yourself commanding either the combined armies of the free peoples of Middle-earth or the dark forces of Sauron through this game. What is RISK: The Lord of the Rings Trilogy Edition? 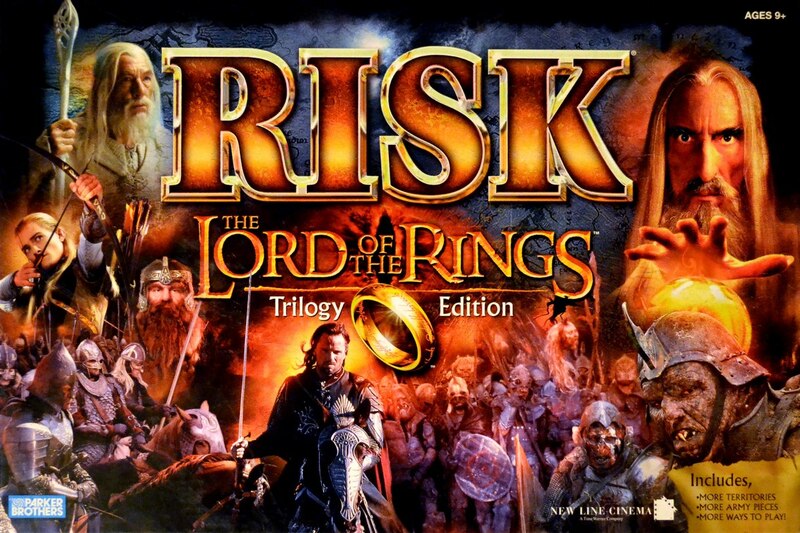 RISK: The Lord of the Rings Trilogy Edition is the enhanced version of the first RISK: Lord of the Rings game that was released during the prime of Peter Jackson’s Lord of the Rings film trilogy’s popularity back in 2003. It was designed for two to four players, with each game potentially lasting from two to four hours. Set during the War of the Ring, RISK: The Lord of the Rings Trilogy Edition puts players in either the forces of good or the evil armies of Sauron to battle for Middle-earth as the One Ring is sought. The Classic RISK ruleset is augmented here by adding in Adventure cards, which are basically like objectives to add more dynamic elements to the strategic gameplay; and the Leader pieces, which are represented by three shield pieces for each team. 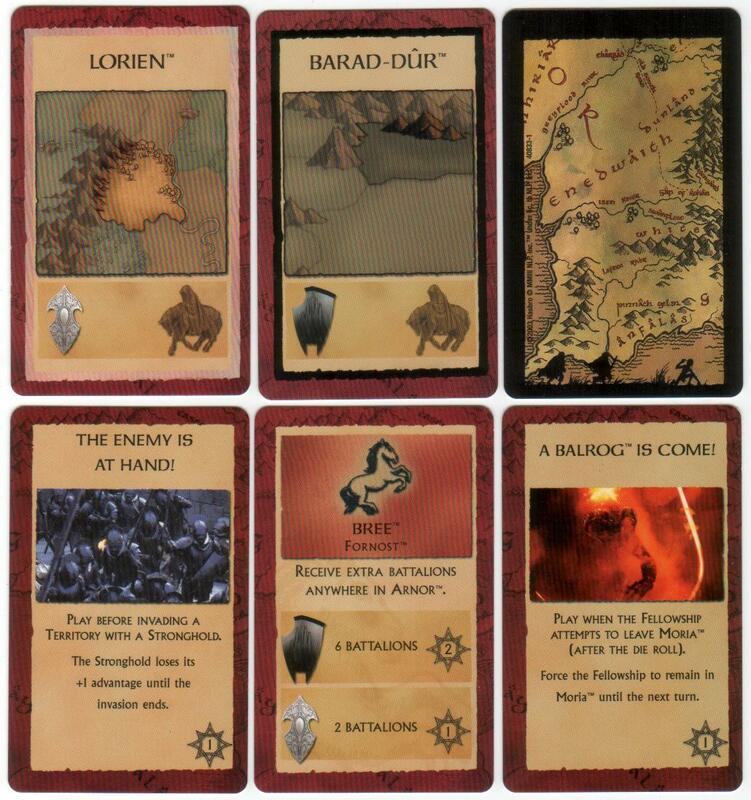 The Lord of the Rings film trilogy is the basis for all the included materials in the game, which are Territory cards, Battalions, Adventure cards, and rules for better team-based play. 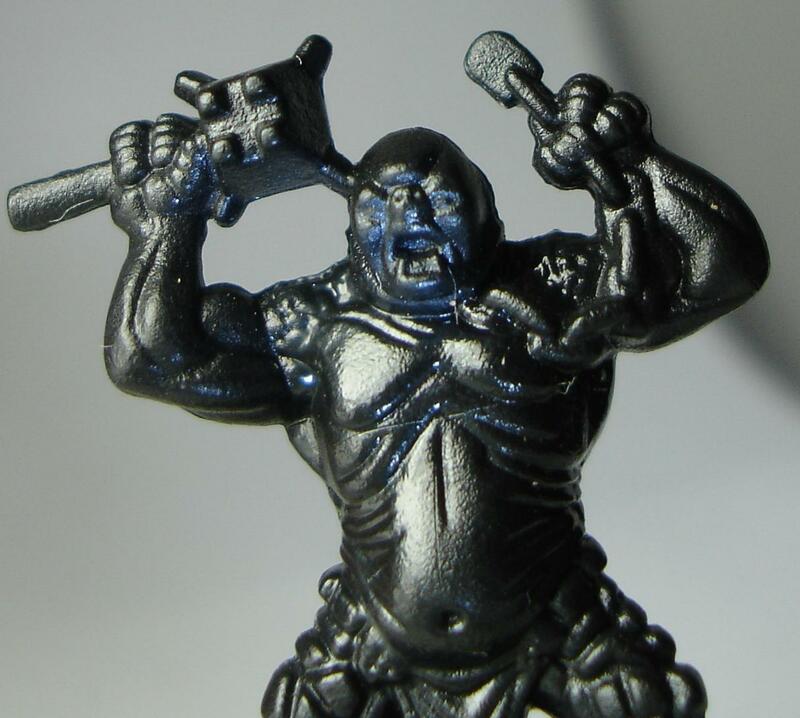 Nicely molded pieces, the game manual, and a pewter version of the One Ring top them off. As Lord of the Rings fans are aware of, wearing the One Ring, even if it is just a replica, is ill-advised. Leader pieces, which look like shields, give bonuses by adding +1 to the highest die roll for attacking or defending. This is a powerful effect, which is why only one Leader piece is allowed in each territory. In addition, a Leader piece can earn Adventure cards by having them enter Sites of Power. Due to this, Leader pieces are a focal point in the gameplay. Each Adventure card contains either a mission that can be completed with a Leader piece, a special bonus for your troops, or special events that can be triggered by certain conditions. Much of the game is juggling between the taking and defending of Territories while completing Adventures. Certain features of the map give players various targets that are desirable for control. For instance, to the west of the map, five Ports litter the coastline. They let you move your troops across the map quickly, letting you cover more area and easily outmaneuver opposing armies. For instance, if a territory is being taken that is far away from your troops, you can get them there easily through a nearby port to reach a port near the disputed territory. The Gold Emblems on the map represent Strongholds. They provide an extra army for reinforcements and a +1 defensive bonus. Holding down Strongholds can prove decisive in this game, as they are much harder to conquer than territories without them. If you have both Ports and Strongholds, you will be nigh impossible to stop. Players get 1 point from Territories, 2 points from Strongholds, and anywhere from 2 to 7 points from Regions. Whoever gets the most points is the winner, simple as that. The aforementioned rules are mostly for games played between 2 to 3 players. However, when there are 4 players, you may choose to play either Alliance RISK or Team RISK. Both of them have two players for each team, but Alliance RISK is merely a team melee wherein players are still mostly out for themselves and don’t win as a tea. In Team RISK, players do win as a team, and it is also where the One Ring comes into play. Trouble follows the Ring as it makes a journey towards Mount Doom. 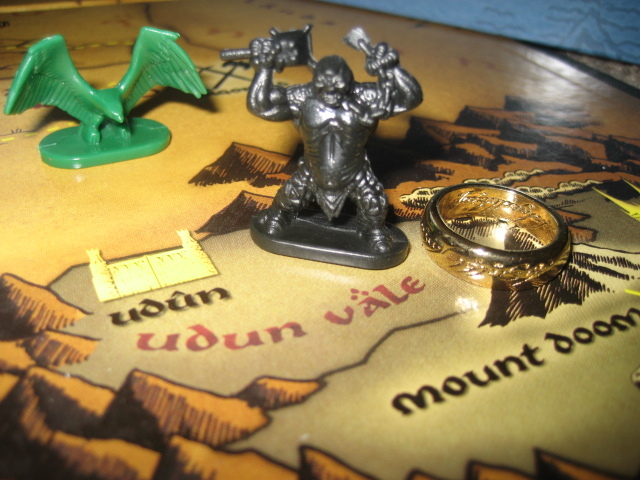 It is pretty much the timer of the game as the Ring either reaching Mount Doom or being found by an army of Mordor signals the end of the game. Obviously, the forces of good want it to reach Mount Doom in order for it to be thrown into the fiery lava, while the forces of evil would want it returned to Sauron. This is the main gameplay feature that makes this game different from Classic RISK as it is like a timer of sorts in addition of being an objective, which adds more tension to the gameplay. When the Ring crosses an evil Territory on its way to Mount Doom, that is when it can be found. The owner of that Territory rolls 2 dice, plus 1 more if there’s a Leader piece there. If the total of the dice roll, including bonuses, adds up to 12 or more, then the Ring is “found” and the evil team wins. 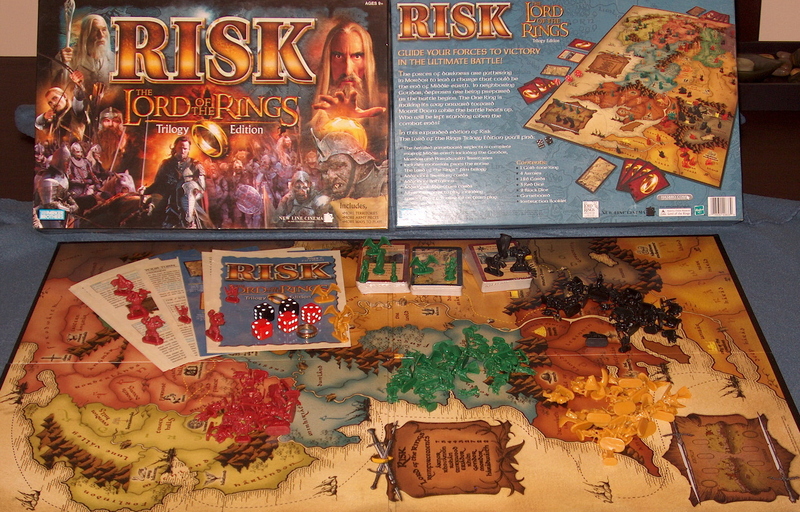 RISK: The Lord of the Rings Trilogy Edition pretty much plays like the first release of RISK: The Lord of the Rings. However, that first version had only Middle-earth in its map, excluding the realms of Gondor, Mordor, and Haradwaith, which Lord of the Rings fans criticized. The Trilogy Edition then came to be, fixing most of the problems and adding some improvements to make it a better experience overall. A thing worth noting is that while the idea for the One Ring reaching Mount Doom to end the game is indeed good on paper, it’s also reported that the mechanic makes for plenty of early endings, which may sometimes be undesirable when a game is starting to get good. While some may just do away with it, that is like taking away the essence of a Lord of the Rings game in the first place as the One Ring is a major narrative device in Tolkien’s works. Nevertheless, that is actually what makes this RISK game good for more casual fans of the game. Since RISK is infamous for games dragging on for too long, this Ring mechanic in RISK: The Lord of the Rings Trilogy Edition makes for faster and more dynamic games that are meant to be more fun for those who are not deep into the Classic RISK game. If you are indeed a fan of either RISK or The Lord of the Rings, then you will enjoy this game. If you are a fan of both, then that’s even better as you can experience RISK through the lens of Lord of the Rings, being able to imagine yourself commanding the forces of either good or evil in Tolkien’s magnum opus. RISK: The Lord of the Rings Trilogy Edition can certainly look good in any RISK or board game collection, and can also look good when placed alongside the Tolkien books. Whether you are a collector, an avid board game player, or merely a fan of Tolkien’s works, then you should find this game to be a welcome acquisition. Playing this currently w/my 9yo son – my wife won’t play against me anymore. 🙂 We got the board game as a wedding present almost 15 years ago! I love it! It is a fun game. It a fair amount of complexity to a normal risk game. Plus the map is well done. The only drawback is the max number of players at 4, but it does make sense for the map size and number of territories/commands.